MTN Project Fame West Africa is here again; bigger, better and more exciting. Yes indeed, West Africa’s biggest music talent hunt competition is its 8th season and you have a chance to be one of the contestant as the Live auditions is coming to a location near you. This Saturday, June 20, the Bolingo Hotel, Abuja and Vointel Hotel, Port Harcourt will play host to the wannabe music stars as they slug it out for the right to perform in Project Fame. So are you ready to live the dream? Are you ready to perform in Africa's biggest music talent reality TV show? 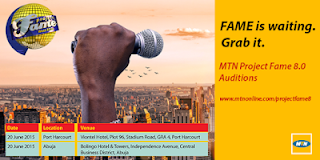 Come display your singing talents at the auditions in Abuja and Port Harcourt. to dial 5900 on your MTN line, listen to the voice prompt, follow the instruction and you will be given a unique PIN number. You can also record your songs and submit it via the Interactive Voice recording Platform. After Abuja, the MTN train will move to Ibadan and Accra, Ghana on 27th July while Lagos will be the next location for contestants on 3rd and 4th of July. Prospective contestants can log onto www.projectfamewestafrica.com For more registration and audition details.